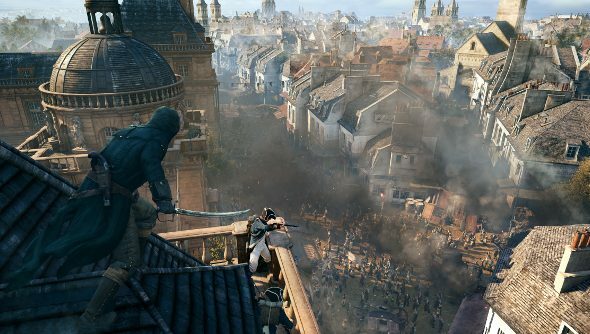 While the French celebrate Bastille Day, remembering the storming of the Bastille and the subsequent uprising, the rest of us can just watch a new Assassin’s Creed Unity trailer, showing off new single-player footage and lots of jumping and murdering interspersed with hyperbolic accolades from E3. Take a gander at the video below. Ubisoft’s also put together a second trailer detailing Unity’s setting: the Revolution and The Reign of Terror. It breaks down the historical events and ties it into the fiction where a puppet master appears in the chaos, presumably the Templars. I am, I confess, starting to find it a little odd that I’ve yet to hear a single French accent. Ubisoft is French and Ubisoft Montreal is in French-speaking Quebec, making it all the more strange. Hopefully the authenticity is being saved for the game, because right now it’s more like the BBC’s bizarre Musketeers TV show.